This is not a flavour I'm familiar with but it's ICE-CREAM so who cares! Kristin of Twinkle Twinkle has set this challenge and informs me that it's called 'Baseball Nut' ice-cream in the USA. Perhaps that's why I've not heard of it before. I took it fairly literally in my first piece, an ATC using the fruit and the colour of cashews. 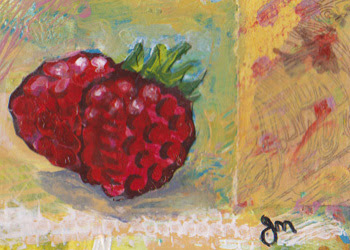 My next ATC simply used the palette, and I collaged and painted. My jewellery however has stretched the brief somewhat, using some red and some brownish. I have used handmade glass beads I bought from a glass artist in South Australia, Karen Porter. She is unfortunately away at present, but try the link later. This week went so fast I feel that I am only barely ready for next week's challenge. But I will certainly give it my best shot. Wow such yummy pages and love the jewelry!! Great job thanks for sharing!! Love your beads Jo - they are marvellous!! Pity it wasn't more like icecream weather - but hey - you make it sound like it might be!! Your art is fabulous! I love the layers & design in your ATC's! Two beautiful ATC's - I love the background of the first one, it's so textured, with such lovely subtle colours. Love your projects here Jo- but I especially LOVE!! your bird feeder ATC-that is so me. I missed this week since I was camping but I'm ready to jump in on the next one. I really like what you did here and sometimes stretching the brief is a good thing....anything to keep us creating, right? Those are some beautiful beads, I can see why you bought them. 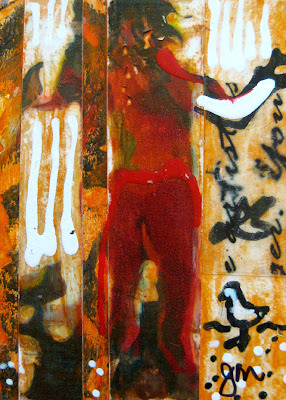 And, of course, I love your collaged piece - great colors and depth. Wow ypur raspberries look so plump and juicy...yummilicious! Wonderful ATC's, and your necklace is gorgeous. I like how you turned something so American into something of your own with an oh so different twist. You made some beautiful ATCs and jewelry for this week. I live in the US and I have never heard of that flavor either. I think that the ice cream pictures are great inspiration though. What a lovely idea, being inspired by ice-cream? Beautiful beads and I loved your planking photos too. Looks and sounds gorgeously delicious! Ice cream is a fav this time of year in the states for sure! YAY !!! A surprise prize.